I hate fireworks. I have never have liked them and I don't understand the fascination. Part of the reason goes back to when I was little and my mother's family thought that buying m-80's and setting them off would be fun. It wasn't and it pretty much cemented my hate of loud noises. In college I tried going to one of the huge fireworks displays at night and people were paying more attention to each other than the fireworks (if you get my drift, there more clothes on the ground than on the people). Thankfully my kids and husband aren't big fans of fireworks either so it has been almost 9 years since I have seen fireworks on the 4th. I do like sparklers, but with only males in my family they have no appeal to anyone in my house except me. So my family will be celebrating the 4th without fireworks, which is just fine in my book. The 4th of July always makes me think of cookouts, and cookouts make me think of corn on the cob. While I would love to fire up the grill everyday, sometimes the charcoal grill is just too much effort (and my husband will not allow a gas grill anyone near our house). It's during these times that I grill my corn in the oven. It's easy and literally only takes 30 minutes. The recipe is as follows. 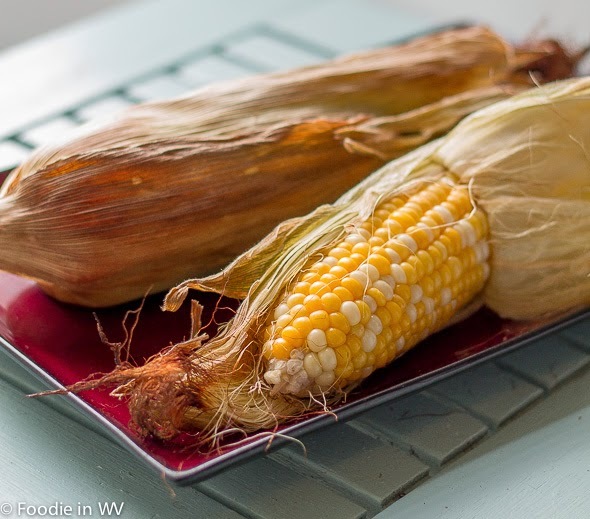 Simple and easy recipe for oven roasted corn on the cob. Never soggy like boiled corn. Keeping husks on corn place directly on the middle oven rack. Roast corn for 30 minutes. Pull out and season with salt and butter. Alternatively you may also rub the ears of corn with butter and pull the husks back up before placing them in the oven. That's it. They turn out great roasted in the oven without the soggy taste that often happens when corn on the cob is boiled. I have a huge corn on the cob obsession and when it gets cheap in the middle of the summer we eat corn almost everyday. Have a happy 4th of July tomorrow everyone! I dont like fireworks .the noise is terrible. I love yours oven roasted corn! Dear Ann have a nice 4th July! I dont updated any new post in my blog because I.m sick with FLU. I didn't know you could roast corn in the oven, but it does make perfectly good sense. Had some of this last night on the Coney Island boardwalk!